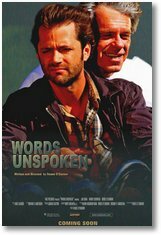 ROC's short film Words Unspoken is for sale on DVD through ROC Pictures. This short film is fantastic. Renee presented it at the 2009 Xena Convention and EVERYONE was moved by it. It is truly a fantastic short film. It provoked such a rich discussion at the convention that was both thought provoking and extremely emotional. I urge everyone, if you can, buy a copy; you won't regret it. Renee has written such a beautiful story; it will move you and you will have some sort of reaction. The DVD is currently available to those in the US, Canada and Europe. There is no mention of Australia / NZ or anywhere else for the moment.